Even under the most normal circumstances, high school can be a painful and confusing time. Unfortunately, Lilianna’s circumstances are anything but normal. Only a few people know what caused her sudden change from model student to the withdrawn pessimist she has become, but her situation isn’t about to get any better. When people begin coming down with a quick-spreading illness that doctors are unable to treat, Lil’s worst fears are realized. With her parents called away on business before the contagious outbreak-her father in Delaware covering the early stages of the disease and her mother in Hong Kong and unable to get a flight back to New Jersey-Lil’s town is hit by what soon becomes a widespread illness and fatal disaster. Now, she’s more alone than she’s been since the “incident” at her school months ago. This book brings back odd memories of World War Z. There are only a handful of books I can honestly say I haven’t completed, and that, sadly, is one of them. 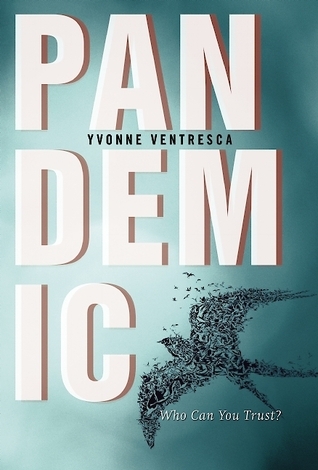 This time around, though, Pandemic takes the story of one ghastly outbreak and makes it quite an interesting read. Which, yes, means that I finished it. This story is a small read that’s great for reluctant readers who love the whole epidemic kind of world. And this is where my rant begins, because this novel felt like it was moving along way too fast, while not much was actually happening at all. Then again, this is something I find most epidemic-centered novels are plagued with. Hahaha, I’m always great at these little things. I’m surprised someone hasn’t virtually slapped me over it yet. Never fails. Okay, besides all my funny, sometimes it’s okay for books to move quick. People are dying, survival is dire, etcetera, things need to be moving quick, but, here, it was far beyond that. Without revealing too much, two people who are crucial to the main characters normal life pass on during the course of the novel. This is a big deal. This is a really big deal. Why? You know why. The issue here is we have a main character who finds out about said person’s death, has a nice good cry, and is pretty damn passive about it the rest of the novel. Sure, she’s got bigger fish to worry about, but these people are really important, okay? Why is she going on prancing around with some cute boy when two really important people are dead? Why? Why? Not to say I didn’t like the romance here because, hey, our romantic interest is really big on buying dinner and I love food so you know I’m all about it, but things just weren’t adding up for me. Something that’s cool about Pandemic, though, is that this is something that could easily happen at any time in the present world, even right now. And that’s the scariest part, which in turn makes the book even harder to read because the whole time you’re thinking these horrible thoughts. Maybe this was my WWZ issue? Also, our main lead is a hypochondriac and a germophobic/misophobic so finally we have someone I can relate to properly! Of course, now my phobias have heightened and everyone around me is more irritated about it than ever, but all part of the job, right? Fans of Contagion and World War Z will love this one.